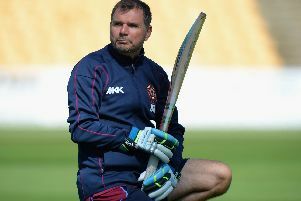 Northants head coach David Ripley has confirmed the county have made an offer to an overseas star with a view to him joining them for the T20 campaign. Northants have managed to secure some outside sponsorship, which has given them the chance to table a bid for a player. And Ripley, who has spent plenty of time searching for a talented recruit, is hoping his primary target will accept. Last season, the Steelbacks were able to call on the services of Shahid Afridi, with the Pakistan legend playing in the first six games of the NatWest T20 Blast campaign. Afridi returned for finals day, helping Northants reach the showpiece, which they lost to Lancashire Lightning. And Ripley is now looking to add the final piece to his team’s jigsaw ahead of the 2016 season. “We’ve got an offer out, but there’s no further news on that,” Ripley said. Northants have already set the rest of their squad in stone, with key men such as Richard Levi and Rory Kleinveldt re-signing for the new season. And two more men who have agreed to stay on are slow left-armer Graeme White and right-arm medium-fast bowler Ben Sanderson. “Ben showed last year that he’s a first-class bowler and he did well in the games he played,” Ripley said. “We need a reasonable amount of numbers to help us get through a season so it’s good that he’s going to be with us. “Graeme’s earned his stripes over recent times in terms of white-ball cricket. “He can clear the boundaries with the bat, he’s a brilliant fielder and his one-day bowling is very good.